In the next installment of Armies of Australian Masters 2017 we have Abyssal Dwarves commanded by Andrew! Andrew is attending Masters for the second time and brings his trusty Abyssal Dwarves again. In the last season he commanded this army three times out of five events that counted towards the Masters and he brings the army that embraces the image of the evil slave masters. 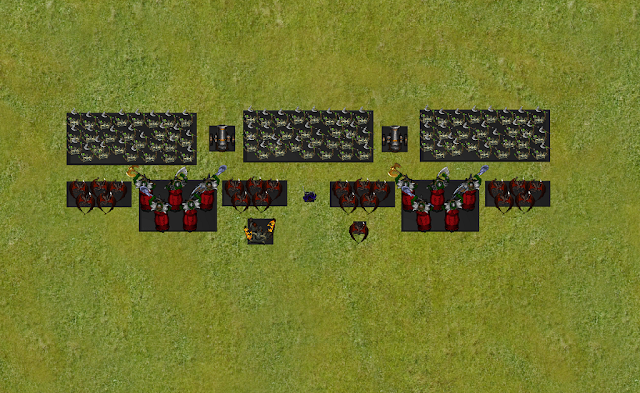 There are a lot of irregular units in this army and it has a really high model count! There are elements with good staying power, those that can deal a lot of damage at range and in melee, good amount of fast support troops - this army will have something to do in every phase of the game for sure! Visual representation of the Army. 2 x 6 Abyssal Grotesques - Huge Abyssal hybrids, the Grotesques are tougher and more powerful than the other Halfbreeds. Without a doubt the most powerful units in the army. They deal a lot of damage and are very resilient. If the attack against them is not equally powerful, they have a great chance to regenerate it and can comfortably enter war of attrition with many units and win. One of the units is as fast as any heavy cavalry and the other ignores any difficult terrain with its Pathfinder upgrade. 3 x 40 Slave Orcs - The Orcs’ great strength and brutal ferocity are an asset to any army, and the Abyssal Dwarfs push vast hordes of enslaved brutes towards the enemy before committing their own troops. Not as well protects as "free" Orcs and don't sport similar armor but they make up for it with numbers. Still reasonably dangerous in the attack thanks to Crushing Strength (1) and with nice 20/22 nerve they should hold the line long enough for their masters to deal the killing blow. May sometimes "misunderstand" the orders which should create quite interesting situations! 4 x 10 Gargoyles - These dumb creatures always follow the armies of the Abyssal Dwarfs, hanging in the sky like a sinister pall, ready to plunge with voracious appetite onto wounded warriors and stragglers. Air support of the army. They are super fast, can intercept enemy fliers and pin them down for short while but long enough for ground troops to catch up and have very nice regenerative abilities. Low nerve means that may not come to use but if not exposed too early they can be very annoying later during the battle when the enemy needs to fight the ground troops. 2 x Angkor Heavy Mortar - The Angkor mortar is a large artillery piece that fires huge shells filled with the explosive concoctions of the Iron-casters – any regiment it hits directly disappears in a cloud of smoke. Long range heavy artillery. The Mortars may not hit often but when they do then there is a lot of damage. They are obviously a great psychological weapon too and thanks to Indirect special rule they ignore cover - that adds to uneasiness of the enemies who may need to advance under barrage of heavy shells. Greater Obsidian Golem - Black stone-giants that tower over the battlefield, these monsters thunder against the enemy under the control of the Iron-casters that animated them. Slow but purposeful. It may stay as rearguard and defend any objective that it needs to hold. May as well stop some enemies in their tracks and slow down their advance, not letting them to outflank the rest of the army. Very reliable too as cannot be wavered and getting through Defense 6+ is always a challenge. Slavedriver - The cruel symbols born on the banners of the Abyssal Dwarfs are often the last thing many folk see as free individuals. The single source of inspire for all units in the army, he may have quite important role to play. Although Slave Orcs and Grotesques have a good nerve, he can add the effect of the Banner too and would make sure any lucky nerve tests are re-rolled. Ba’su’su the Vile - A halfbreed of great power, Ba’su’su the Vile, is a mighty pinioned monster, tormented by the low status his halfbreed nature condemns him to. Worthy a unit on his own, this infamous hero can keep rather cowardly Gargoyles in check for a bit longer but also can mess up with enemy war engines, shooters and take on smaller units all by himself too. Please, let me know what you think about this army! Probably the most fearsome list I’ve read so far. As one who abuses ba’su’su and gargoyles myself, I know firsthand how great they are at disrupting enemy plans. He has a good mix of hordes with high nerve and fast elements with some of the most dangerous warmachines in the game. Any of your units hit by one of those has a good chance of being routed in one go. The major weakness is the lack of inspiring so target selection may become easier. Picking off units away from the inspiring bubble seems to be a good way to go. Looks like a fun list! Very interesting comments! Almost all the armies are completely new to me so learning as much as possible is crucial! Gargoyles are great but I wonder if you have anything in particular in mind in terms of what exactly one should expect from them when Ba'su'su is also present.